i just wanted to show off what some other folks were doing with the april fiber club, however i was not organized enough to ask to steal pics, so please click through the links! here’s abby’s, i really love how she spun it! it shows off the colors perfectly. alex has already spun and knit a hat out of hers. she was crazy fast. love that pompom. and katy’s gigantic looking skein – yum! 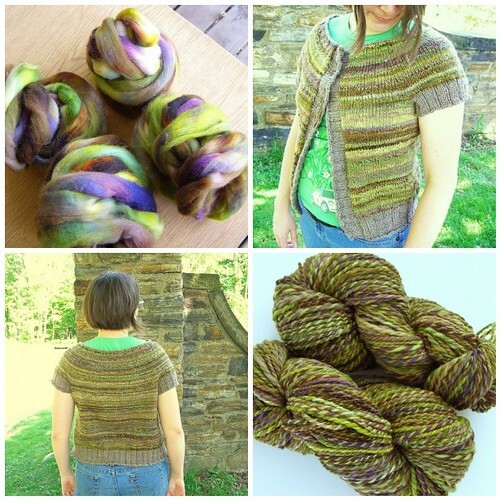 and, i must say, i love the look of this colorway in bulky on kt’s blog. and that’s only a bit of the fiber club. can’t wait to see more projects popping up! p.s. maryland sheep and wool left me dirty, sun burnt, and three fleeces richer! more about that later. This entry was posted in community, cosyknitsliterally, cosyspins, fiber club, handspun, knitting by cosymakes. Bookmark the permalink. you seriously have a sweater out of it already?! and here i was proud to be almost through a pair of fingerless mitts with the handspun that came off the wheel right after croci… it was wool from your shop too, by the way. the sweater (and everyone’s projects!) looks amazing! i am getting such great yardage out of your falkland, with absolutely no misery. it’s so easy! i may never want to spin anything else! hee hee. i do this full time, you know. but that was a lot of knitting, even for me! i just got on a roll. Mine just arrived in the mail today. It will definitely be spun in the next few days. I just got my wheel last week and handpainted rovings are in short supply in my stash these days. yay! can’t wait to see what you do. Is there a Flickr group/Ravelry group for the fibre club? I think we should set one up to see all the yumminess. there is a rav group for all things cosymakes that i started because of some questions about my book – but i’d love if you wanted to make either rav or flickr for just hte club. fun!